For $14,500, Would You Hatch A Plan To Buy This 1996 BMW 330ti? Today’s Nice Price or Crack Pipe BMW is a car that the factory never built. Instead it’s a melding of models commissioned by a very dedicated and exacting owner, and now that owner has set a price for his match making. Considering that the five-point-oh is forever intrinsically linked to Vanilla Ice - who is a douche canoe of galactic proportions - I think that it truly is the SVO Mustang’s time to shine. Yesterday’s rare ’85 SVO Competition Prep not only demanded sunglasses, but its price seemed to fully 58% of you to be a pretty bright idea as well, earning the ‘80s icon a Nice Price win. Would You Go $9,000 For This Comp Prep 1985 Ford Mustang SVO? With the SVO, Ford turned the Mustang from crude to glued, imbuing the car with previously unknown levels of civility and competence. They really made it into - as Monty Python once said - something completely different. 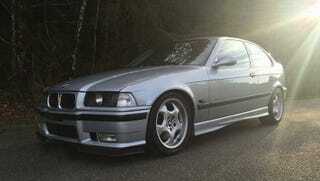 A similar, albeit non-factory transformation took place with today’s 1996 BMW E36 Compact. It’s seller pined for M3-levels of performance, but but also sought the convenience and utility of a four-seat hatch. The ad says that the owner took the car directly from the North Hollywood Bimmer dealer where it was originally sold to a place called DME Engineering. They made the switch from mild to wild and created what’s basically an M3 Compact, which the seller is calling a 330ti. Now, that’s sort of like taking your Big Mac over to In-N-Out and asking them to Animal-Style it for you. Still, if you think about it, that would probably be damn tasty, and this modded 3 looks to likewise be a nice place to take your buns. The original Compact was an amalgamation of E36 and E30, being the former from the B-pillar forward, and sharing the trailing-arm suspension of the latter in back, rather than the company’s fancy new (at the time) multi-link Z-axle. Power for the Compact here in the States was a 1.9-litre four so that less accomplished back end wasn’t all that big a deal. This car is a big deal as the work done by DME included the replacement of the four with an M50 six out of an M3, a 5-speed stick from the same source, an E28 LSD out in back, and E36 M3 suspension bits up front. There are also Dinan kibbles and Koni bits to keep things in line, and the ad notes that the M50 pumps out 280-bhp so there’s plenty to keep in line. It all looks the part too having been given an M3 nose, M3 wheels bookending M3 rockers, and a subtle spoiler on the hatch above its M3 rear bumper. The car is said to rock just 51K and it looks - in the pictures at least - to be pristine. The Compact has always been a little awkward in appearance, but this one is so butched up that I wouldn’t say that to its face. Inside it’s just as M3-a-licious, gaining seats, shifter and wheel - basically everything you’d touch - that come from the sporty model. The original seats and tiller come with the car as well, if you’ve got the garage space. All the parts put on the car are said to be OEM and new at the time, and not pulled from a wreck. That sounds…. expensive. You’ll now need to decide if at $14,500, this neither fish nor fowl BMW is too expensive. The car is clean as a bean and is pretty unique in concept and seems well executed. What do you think, is it worth that kind of cash? or, is that too much to make your Deutch mark? H/T to Evil Kyle for the hookup!